Budapest: Ferrari’s Sebastian Vettel overcame steering difficulties to win a tense Hungarian Grand Prix on Sunday and extend his championship lead over rival Lewis Hamilton to 14 points heading into the summer break. The four-time Formula One champion made a decent start from pole position, crucially holding off teammate Kimi Raikkonen on the long straight into Turn 1. On a Hungaroring track where overtaking is notoriously hard, there were limited chances to catch him after that. 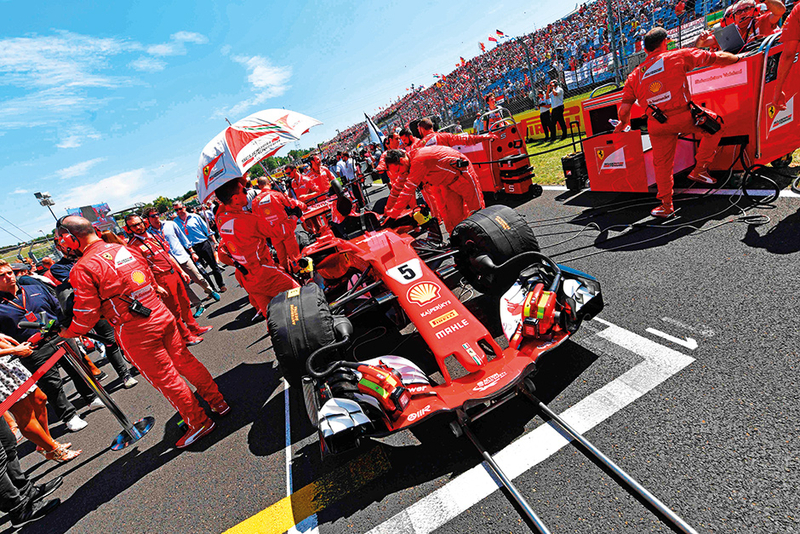 But Vettel was hampered by a steering issue for more than half the race, allowing the Mercedes cars to close the gap on him and Raikkonen — who in turn was being slowed down by Vettel. Vettel held on for his 46th career win, while Raikkonen expertly defended his position for a Ferrari 1-2. “Grazie! 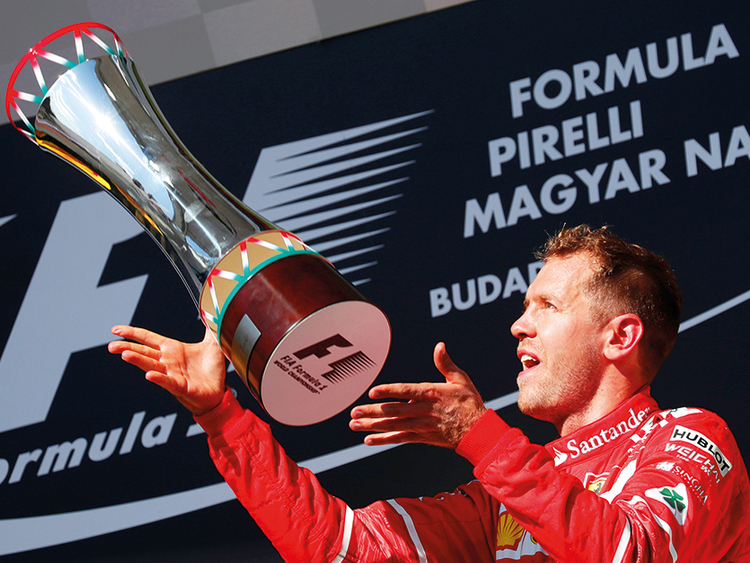 Forza Ferrari!” a jubilant Vettel shouted on the team radio after crossing the line for his fourth win of the season. This one owed much to Raikkonen’s cagey driving, and Vettel in turn owes his Finnish teammate a favour after this. He patted Raikkonen on the arm in appreciation as they prepared to mount the podium. Earlier, Bottas had let Hamilton past in order to attack the Ferraris. Hamilton then sportingly gave him third place back right at the end. “Thanks to Lewis for keeping his promise,” Bottas said, underlining the feeling of mutual respect between the teammates. Over at Red Bull, there is unlikely to be such harmony. Red Bull’s Max Verstappen was fifth after knocking out of the race his teammate Daniel Ricciardo on the first lap. Ricciardo’s race was over after the contact on Turn 2, bringing the safety car out for a few laps as his car was towed off the track. Verstappen was the perpetrator — swerving into his teammate when going wide on the exit from a turn. “Was that who I think it was?” a stunned Ricciardo said over his team radio seconds after being hit. It was a big blow for Ricciardo, who had secured five podium finishes in the previous six races. As he watched replays of the incident in his team garage, Ricciardo looked stone-faced when he saw confirmation that it was his own teammate who was responsible. “That was amateur to say the least,” Ricciardo told broadcaster Sky Sports afterward. Verstappen was given a 10-second time penalty for the incident, helping Hamilton’s cause. But Raikkonen’s wily driving never gave him a real chance. Hamilton had written off his chances of victory after qualifying, saying it would be an “easy breeze” for Ferrari on the tight and twisty 4.4-kilometre (2.7-mile) circuit nestled in the hills surrounding Budapest. Only the sinewy street circuit of Monaco is tougher to overtake on. Even before the race had started, Hamilton sounded extremely anxious as he spoke on the grid about overheating in his rear tires. In the end, it was Ferrari sweating in the hot Hungarian sun. Ferrari faced an awkward dilemma as the race wound down with Vettel leading but under instruction to avoid contact with the kerbs because of his steering problems. The result was that Vettel was slowing down Raikkonen just behind him. “The Mercedes are catching,” a worried Raikkonen said over his radio. Bottas let Hamilton past him, on the condition that he would give the position back if he couldn’t get a clean shot at Raikkonen. With 18 laps left, Hamilton was told he had “five laps” — or about seven minutes — to catch Raikkonen. “No pressure, then.” Hamilton replied. The team then gave him another five laps.